Below is a photo that Bryan Van Norden took of a baseball cap a guy was wearing at a casino in Atlantic City. Someone else at the table asked him what it meant, and he said he thought it was Chinese for "good luck." Bryan explained that he was wrong. The symbol on the cap actually consists of two "letters" of the phonetic symbols that were introduced in the Republic of China during the 1910s. Called chu4-yin1 fu2-hao4 / zhùyīn fúhào / ㄓㄨˋ ㄧㄣ ㄈㄨˊ ㄏㄠˋ 注音符號 ("phonetic symbols") or bopomofo (after the first four symbols of the notation system), they are still in use in Taiwan today. There are several other obscure characters that may be pronounced "wai" and mean such things as "mouth awry", "sprain; twist", "river bend and mountain recess", "scoop", and "inclined; slanting; askew". I doubt that the gentleman who was wearing this cap would have been happy had he known that "wai" not only does not mean "good luck", but has a slew of inauspicious meanings attached to it. 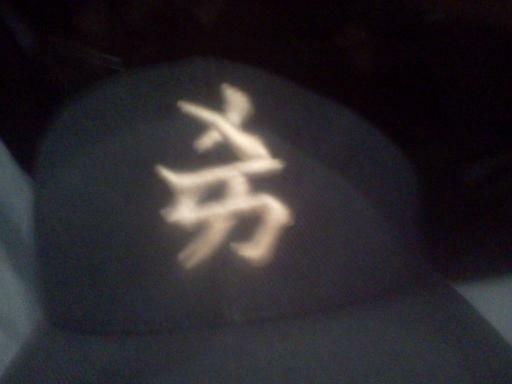 Back in about 1999, the New Era Cap Company of Buffalo, New York put some baseball caps featuring zhuyin fuhao on the market (who knows why?). You can still find them on eBay, some of them at pretty steep prices. Sometimes the phonetic symbols have a relation to the team name, sometimes it's not so obvious what the relationship is. The Atlantic City casino gentleman's cap pictured above is actually for the Yankees, and if you look at the logo on the real Yankees cap shown on the website whose link is provided here, you can see that the two phonetic symbols stacked one atop the other bear a slight resemblance to it. Ju ㄐㄩ for the Giants is easy, since that is indeed the first syllable of the name of the San Francisco Jùrén 巨人 ("giants"). Xi ㄒㄧfor the Cubs is not so transparent, and neither is en ㄣ for the Mets. Bo (ㄅ) and Fo (ㄈ) may have been used as standalone symbols, perhaps for the Braves and the Marlins, though they must be used in combination with other symbols when transcribing Mandarin sounds. Jason Cox tells me that he recalls these caps being so unpopular that he never saw one being worn, so it is quite a throwback for one to show up on a man's head in Atlantic City now more than a decade later. It is also a remarkable coincidence that Jason mentioned these caps to me a couple of weeks ago, while Bryan independently and quite unexpectedly sent me the photograph of the Atlantic City cap just this afternoon. Weird concurrence! Thanks for doing the detective work and finding out what the hat is supposed to mean. I could only tell the guy that my best guess was that it meant "foreign." I think you're missing the most obvious explanation. It says "wai" because Yankees starts with the letter Y. You may well be right about that. If you are, then it would follow that xi ㄒㄧstands for the initial "C" of "Cubs", and en ㄣ might even be considered to stand for the initial "M" of "Mets".
" he recalls these caps being so unpopular that he never saw one being worn"
I feel like I have seen quite a few of these caps around over the last few years – but I didn't realize the writing was actual bopomofo, I assumed the hats were displaying fake or extremely badly rendered Chinese characters. Baseball is fairly popular in Taiwan and American baseball does get some media coverage – are these caps based on how the names of MLB teams are actually rendered in Taiwanese newspapers? "If you are, then it would follow that xi ㄒㄧstands for the initial "C" of "Cubs", and en ㄣ might even be considered to stand for the initial "M" of "Mets"." I'd make one small change: the letters on baseball caps are almost always that of the city name, not the team's nickname. So the ㄨㄞ on the Yankees' hats could be the Y in "New York", ㄣ is the N in "New York" (I think I've seen Mets caps with ㄨㄞ too), and ㄒㄧ could be the C in "Chicago". If the Marlins' caps had ㄈ, then that's the F in "Florida", which was their regular cap logo until a year or so ago when they started using their city name and putting "M" on the caps, for "Miami". I remember these caps from the '90s; there were also caps with team names translated into Chinese characters (the Cubs were 熊 and the Mets — 'Metropolitans' originally — were 都; the college Texas Longhorns were 牛, the North Carolina Tar Heels became 足; the Yankees became 帝). Those were more popular than the bopomofo version because more people could read them. As a student of Japanese at the time, people would show me the bopomofo hats, which are easily confused for katakana, and I couldn't read them. Not until much later did I figure out what they were. But why tell him he's wrong? A guy can think a rabbit's foot is good luck, but I wouldn't want to remind him that it wasn't good luck for the rabbit. Leave the guy to his roulette and his belief. VHM: "Not having a tone indicated, wai could mean either of the following:"
I thought that not having a tone indicated defaults to the first tone? Which is "wai" I would have translated it as "deviant" for the wearer, had I been in the same situation as Bryan. In Pinyin, no tone mark indicates neutral tone; in Bopomofo it indicates first tone. In Pinyin, the neutral tone doesn't have a mark; in Bopomofo, it is indicated by a dot. Caps (and other items, as this link shows) with Japanese characters were extremely popular for a brief period after Ichiro Suzuki joined the Seattle Mariners in 2001. They allegedly displayed a translation of the team's name rather than a phonetic version of it, although I don't know how contrived this translation was. @James: That says "Shiatoru Marināzu", which is a simple phonetic adaptation of the English name. You can tell because it's written in katakana, which are used for transcribing foreign words (and some other things). Xi would be a good transliteration of the Chi in Chicago. It is generally pronounced with an ʃ. "In Pinyin, no tone mark indicates neutral tone; in Bopomofo it indicates first tone. In Pinyin, the neutral tone doesn't have a mark; in Bopomofo, it is indicated by a dot." I think similar rules are the only redeeming feature of Tongyong pinyin. I'm all in favor of hanyu pinyin but I think that Tongying tone marking is better. @michael farris: Unfortuantely there doesn't seem to be any encoded character for ü+˚ like there is for ǖ, ǘ, ǜ and ǚ. Thanks, Lazar. The shirt in the link must read differently than the caps I remember. Those were definitely billed as displaying kanji characters literally meaning "seamen" or something like that. All the letters of the English alphabet are pronounced in first tone here in Taiwan except R and Z. They have to have a standard pronunciation in Chinese because they're used on automobile license plates and a large portion of the population's English ability is limited to just the 26 letters, if that.